A great black hawk made a lasting impression on bird lovers last year when it took up residence in Deering Oaks in Portland. Now, an effort is underway to create a permanent, educational sculpture in the late-hawk’s honor and place it in the park. The Friends of Deering Oaks is in discussions with various groups about creating a life-sized, bronze replica of the tropical bird of prey that captured the imagination of bird enthusiasts all over the country during its short stay in Portland. 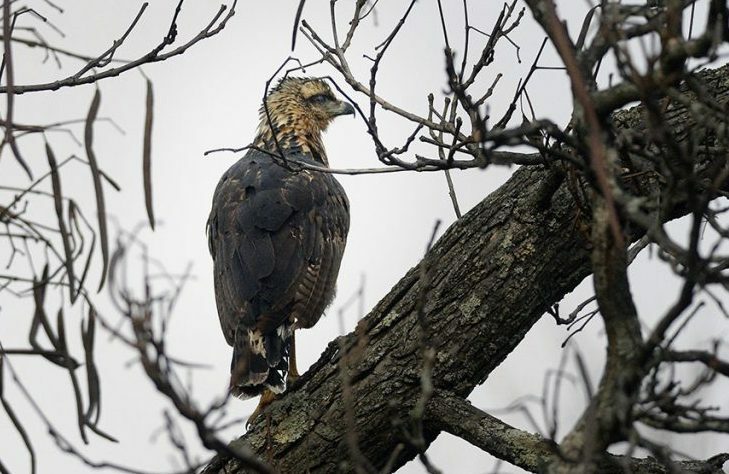 Maine’s winter proved too severe for the hawk and it had to be euthanized after it sustained severe frostbite during a storm in January. The hawk project, which would be privately funded, is one of several initiatives underway for the 55-acre park bounded by State Street, Park Avenue, Deering Avenue and Interstate 295. This summer, city crews will be laying the groundwork to reintroduce paddle boats to the duck pond. And the city will install a 100-foot-long dual zip line in the park’s playground. Plans for the bird statue come after the hawk drew crowds and national attention to the park last fall. It was only the second time a great black hawk was seen in the United States, Maine Audubon said. The hawk made itself at home in the towering oak trees and foraged for squirrels, mice and rats in the Portland park, thousands of miles from its native range in Central and South America. “We feel there is a story to tell,” said Diane Davison, a Portland resident and bird rescue volunteer, who first cared for the bird after it was found lying on the snow-covered ground in January, and helped deliver it to Avian Haven in Freedom. 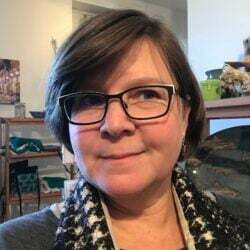 The president of the Friends of Deering Oaks, Anne Pringle, said that the hawk project is in its initial stages and that city approvals and private fundraising are still needed. But the goal is to commission a Maine wildlife artist to create a life-sized bronze sculpture that would be displayed in the area where the hawk was often seen. Pringle said not to expect the statue to have a dominant presence in the park. “The sense is making this a discovery,” said Pringle, whose group is leading the approval and private fundraising process. No cost estimate has been made for the statue and educational exhibit. Parks Director Sally Deluca said the project involves a variety of groups, including the Public Art Commission, Historic Preservation, Maine Audubon and Avian Haven, the nonprofit that cared for the hawk during its final days. Deputy parks director Ethan Hipple said the sculpture, if approved and funded, would likely have an interpretive panel to educate the public about the bird and the importance of having urban habitats and public parks. Vagrant is the term ornithologists use for a bird that flies far from its normal geographic range. The bird’s body has been preserved and will be mounted and displayed at the Maine State Museum in Augusta. The hawk statue project is underway as the city prepares for other additions that could bring more visitors to the historic park. The 100-foot zip line will be the next improvement to the playground. Last fall, park staff installed a 25-foot-tall, pyramid-spaced net climber to the playground. 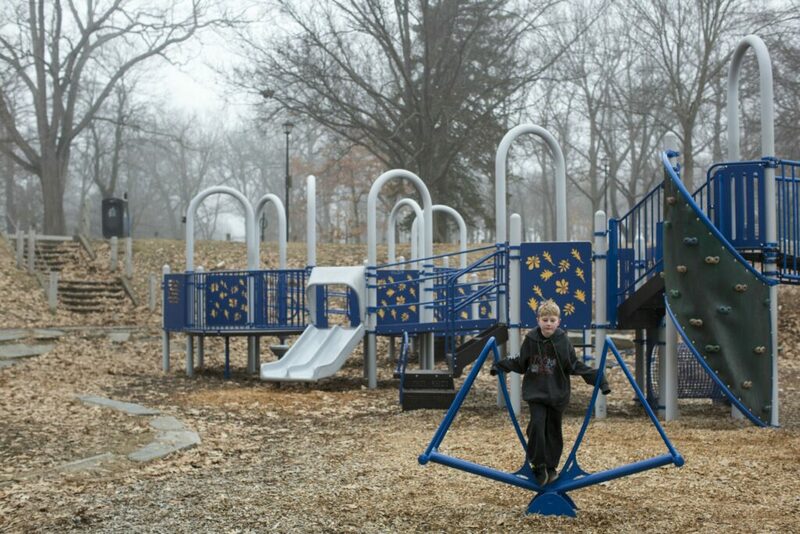 The zip line could be added at the playground this summer. But Hipple said it is still being designed, so cost estimates and funding sources are still being put together. Another project could bring back paddle boats, which were a summer amenity at Deering Oaks from the late 1890s through the 1980s. The city must improve water quality at the pond before paddle boats can be brought back, Hipple said. Rather than using chemicals or pesticides, which are banned in the city, Hipple said the city will install an aeration system in the pond to combat algae growth. The city would share the cost of the water quality improvements with private supporters of the park. Hipple said the 16 aeration heads would cost about $15,000, with about $10,000 of that coming from a grant from the Friends of Deering Oaks and the rest being paid by the city. If the cleanup is successful, paddle boats could return the next year, depending on the success of fundraising efforts. The Friends of Deering Oaks would pay for the paddle boats, and no cost estimate was available. Pringle said the Friends also will make some repairs to the edge of the pond, including the installation of a new boat dock, to prepare for the paddle boats’ return. Each project hinges on bids coming within budget. “Key factors are the tight bidding environment and contractor availability,” she said. So nothing is yet set in stone.